The Life Of Captain Marvel #1 Review – AiPT! Captain Marvel is back with an emotionally arresting first issue. 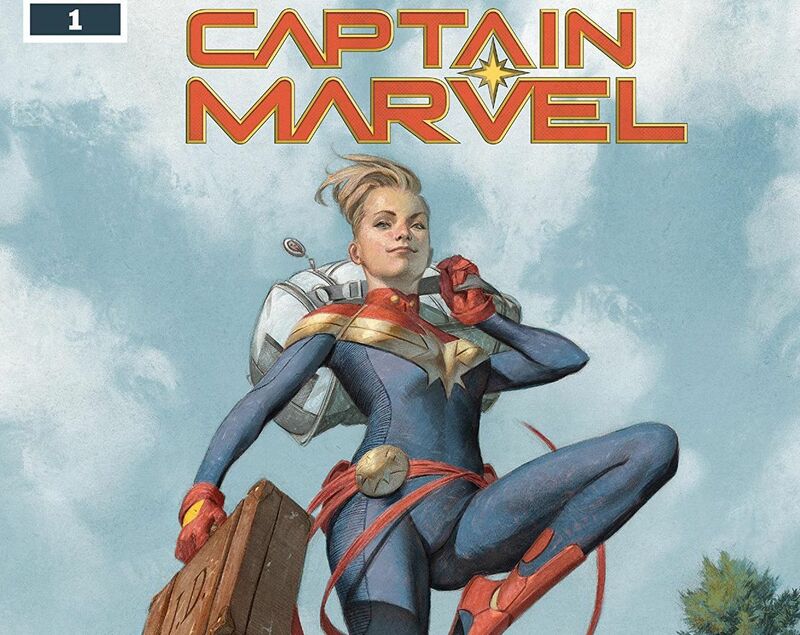 Carol Danvers is going home in her new series from writer Margaret Stohl, a series being pegged as the “Definitive origin of Captain Marvel.” The series sees Carol return to Maine, confront her family issues, and potentially unlock something that shouldn’t have been unlocked. With the Captain Marvel movie less than a year away this character is more important than ever. This series aims to flesh out Carol’s backstory growing up, further developing her and making her more complex. Given her somewhat rocky beginnings this is a good thing. Ah, New England summers as a kid. Good times. This issue does a lot to humanize and ground Carol’s character in a way we don’t often see in superhero comics. Opening in Maine, Stohl shows us Carol’s life as a kid during the summer which is about as iconic as one can get for an American kid growing up in the last 30 years. There are beach days, getting into trouble, and eating lots of sugar. It’s the American summer many have enjoyed, especially people who live in New England like me. You can practically smell the sea water due to how well these scenes are rendered. Things turn for the worse though when family issues, more specifically violent father issues, crop up. This trauma ties into the now well as the comic cuts to Carol beating down supervillains. It’s an opening that humanizes Carol in a believable way and reminds readers even if you have superpowers you can have family baggage like the rest of us. Much of the rest of the issue focuses on Carol going home and hanging with her brother and mother. Stohl writes believable dialogue that continues to ground this character. She may fight supervillains like Thanos but coming to grips with her family issues may be even harder. As she attempts to navigate her pain and memories she’s given some emotional backup from Tony Stark who later in the issue attempts to get through to her that being a superhero is important too. Anyone who has had to take time away from work for family are going to relate to this book. It’s not all therapy and family issues, though that is the majority of this book. No, the issue closes with a potential rising conflict that should put Carol’s superpowers and family psychosis to the test. Carlos Pacheco draws an issue that’s at once whimsical and emotionally clear. Carol is dealing with a lot and you’re always tuned into her emotions be it frustrations, confusion, or even desperation. This issue feels decidedly like the first half of a chapter. The hook of the series is hinted at in the last few pages, but we don’t actually see it which leaves you a bit wanting. Much of this issue is focused on Carol dealing with her family and the skeletons in the closet that come with it — making the balance between superhero life and home life tilted too much towards home life. I have a feeling reading issue #2 will balance things out. As superhero comics go a scene or two using her powers in her hometown might have balanced things out, but instead there’s a large chunk of Carol simply talking to her family and weighing in on her life as a child. This is a strong first issue that does a good job grounding Carol and making her relatable. She may fight alien dictators, but an even harder fight may be dealing with deep-seated family issues. Much like any family Carol’s family may have secrets that could change not only how she sees them, but herself too. The Life Of Captain Marvel is relatable, real, and gripping. A strong start that has me more engrossed in the character than ever.